Boy, have I missed you guys. I am happy to say that our house remodeling project is mostly done and we have a kitchen again! It is indeed, as everyone who's ever remodeled their home (or parts thereof) has said, "It's all worth it." Yes, The After is always glorious. The During, however, was . . . shall we say, an adventure? I've learned that remodeling, no matter how efficiently performed, and particularly when it involves the kitchen, is disruptive in ways one can never imagine beforehand. Not being able to cook, for instance, is only a tiny, superficial part of it. I felt more the loss of my creative space. Not the physical aspect of it, although my sewing room became the dining room for many strange but wonderful weeks together as a family in culinary limbo. I mean the abstract space - that open, undistracted, uncluttered, unpreoccupied state of mind in which to imagine, create, dream, and simply be excited about making something new. I've missed that so much. Particularly because my home is, in a sense, my studio. And not just as a place to execute artistic work. Every room in it is a source of idea and inspiration because of the people who live in it and throw their clothes and toys around in it and cause it to malfunction in ways that beg fixing and improving and making over. In the old days, I'd walk around and pick up a bunny, or trip over a plastic cupcake, or shudder at a hideous unmatching accent pillow and some idea will knit itself together in my mind, and you guys might see the manifest outcome in a blog post not long after. Where do you get your ideas? I've often been asked. Short answer: The Everyplace - that literal common ground where life happens to real people. I've missed working, too. And blogging. And all the in-between tasks related to sewing and design and delivering it to the internet at large. I've even missed the mind-numbing administrative record keeping that comes with the job. Then I had to remind myself that, creatively bereft or not, being a Mom, and running the (weird and very alien) house was work, too, and important work at that, especially when everything else felt like entropy around us. Oh, the stories we'll tell of the memories we made of the weeks we spent living in untraditional rooms in the house that Jack - I mean, the remodeling company - built. But it is done. And I am slowly coming back to life. One of my rewards to myself for moving everything back into the new living spaces was sewing a cushion for our new bench. I was very excited. I made multiple trips to multiple fabric stores for fabric samples. I measured and re-measured and drafted my pattern and incorporated the compressive effect of high-density foam under a negative woven-fabric stretch factor, and felt oh-so-methodical and scientifically precise. And then I looked at my first draft. nor dissect them in excruciating detail, so that we may all learn how not to fit a cushion. Behold: the edge that juts out too far over the bench. Here is the other corner, in case that first one didn't convince you. 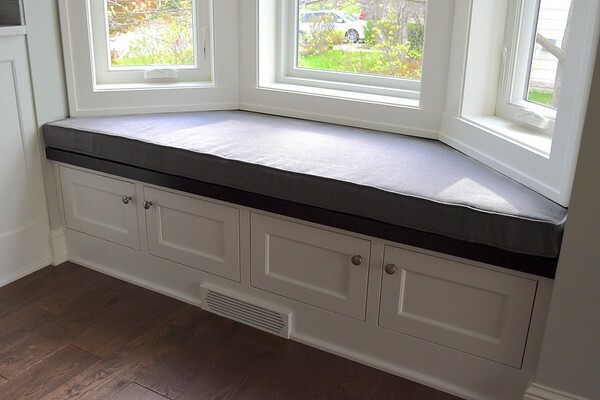 And behold also: the entire cushion was too long for the bench, in spite of being made to the exact interior measurement of that space. Do you see the wrinkles? 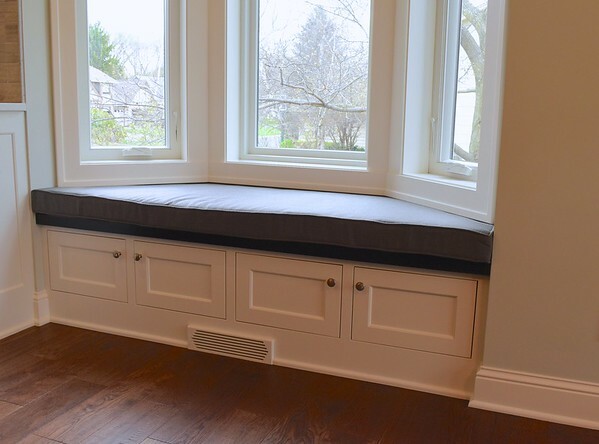 Finally, behold the cushion profile as it fits (and here I am taking liberties with the semantics of that term as it clearly does not fit) into the space under the window frame. 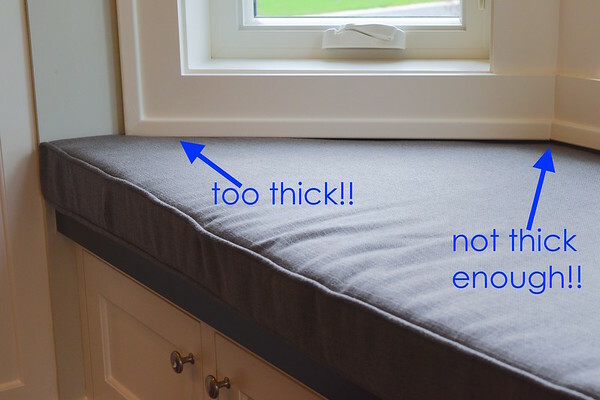 While the cushion is of uniform thickness throughout (because the foam is), the space into which it must fit isn't, and I never even thought to measure the sill-bench spacing under the window to verify that it was, indeed, constant (it wasn't). 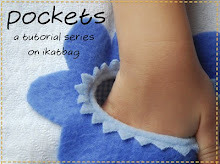 Let's backtrack a bit to Cushion-Making 101 so we remember how to make a cushion. First, the insert for a cushion such as this should be foam rather than, say, polyfill stuffing. 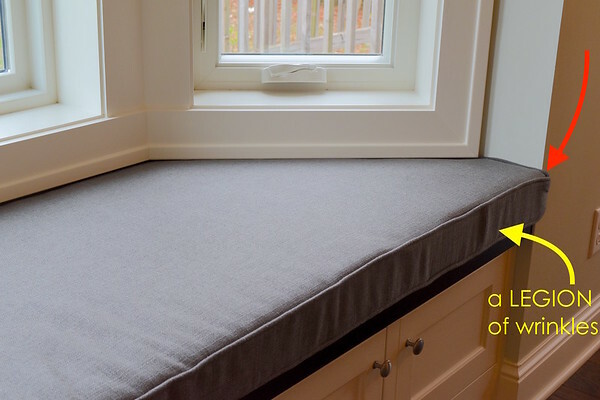 And the foam should preferably be of the high-density kind so that when one lowers one's considerable bulk onto the cushion, one does not immediately and uncomfortably sink to the hard surface underneath. 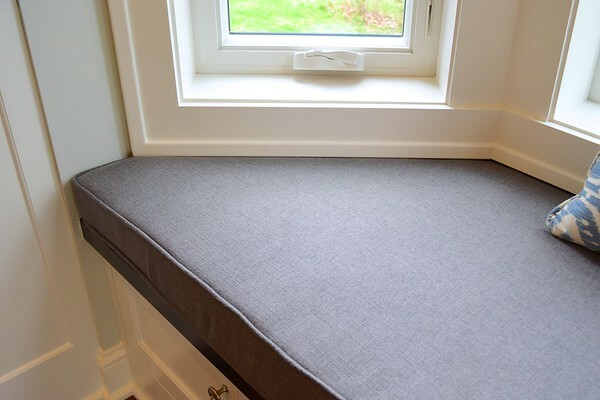 Second, one must lay on at least the top surface of the foam, a layer of batting, so that the fabric has some padding to reduce the likelihood of The Sagging Cover effect. You are familiar with this phenomenon, yes? You make a cushion cover to the exact external dimensions of the foam insert, but when put over the foam, the cover has hollow corners and spacious seams and wrinkles all over, as if carelessly made too large. So then you unpick everything and take in the seams, and overcompensate so as to "stretch" the cover snugly over the foam, but then you find that the crisp edges and corners of the foam insert are now squished and the entire cushion, rather than the sleek rectangular prism it was meant to be, now looks like an indistinct blimp. It's not you, you know. It's the foam-fabric interaction. It does not manifest with soft pillow forms, which are shapeshifters and can meld into corners with ease. It's when working with fixed-shape foam inserts that all hell breaks loose. Now, some fabric comes already padded on the wrong side. Some upholstery fabric, for instance, is felt- or flannel-backed (and now we know why). But most fabric, even home-dec fabric, does not. And when working with quilting-cotton and other lighter-weight fabric, this effect is even more pronounced. So we line the WS of the fabric cover pieces with a layer of batting. Or glue the batting to the foam surfaces themselves, if you prefer (I personally do not prefer). 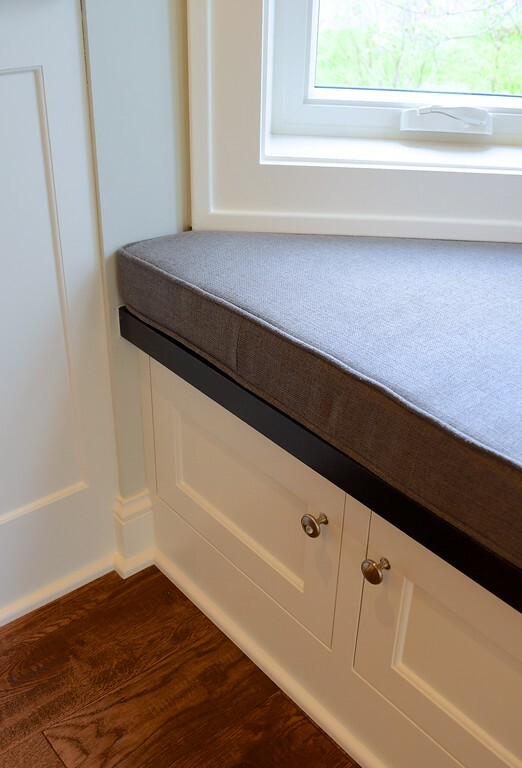 Third, one must take into account the added thickness of that batting and - if present - piping, and correspondingly reduce either the dimensions of the foam insert, or the fabric cover pieces, or both. I, in my reckless enthusiasm, did not. Fourth, one must realize that foam is heinously sticky and that trying to insert it between layers of fabric will require acrobatics and vast amounts of patience. And if the foam will be inserted between layers of batting-lined fabric, it will feel like everything has been spitefully velcroed to everything else just to test the limits to that patience. Having a very generous zippered opening helps. I, sadly, had a marginal level of patience at best, and was not at all happy to extract the foam from Cushion Cover Version 1, and then wrestle it back again into Cushion Cover Version 2. I also did not have a generous zippered opening. I thought I could get by with a token zipper along the short middle section of the back edge. "How cunningly discreet!" was how I rationalized away all common sense. Oh, the things we learn in hindsight. Let us skip over the copious seam-ripping and splicing-of-piping-and-gusset and acrobatics and behold Version 2. Not perfect, but so much better. Its dimensions look like it was made by someone with actual number sense! See Before-After photos below. Thought I'd share my upholstery misadventures today because they reminded me so much of how I draft and sew garments. Cushion Version 1 is like a person wearing a garment in the wrong size (or a poor draft thereof). We say, "Oh, nice dress," simply because the alternative is that person walking around starkers, but it's painfully clear that the garment does not fit. Those of us who don't imagine there could be a Version 2 will settle for Version 1 and will probably not be particularly dissatisfied. Until we see Version 2, which is then almost a relief to look at after having seen Version 1. 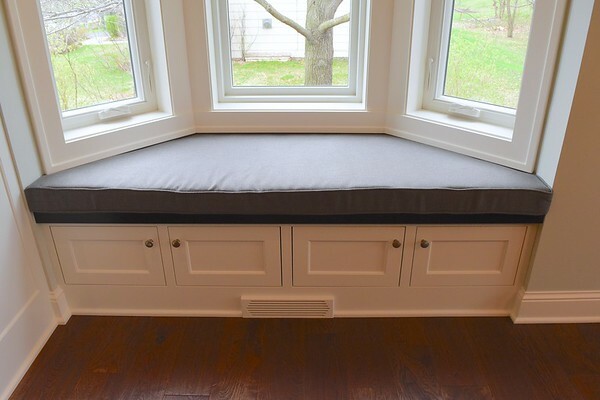 So now I have a be-cushion-ed bay window bench. The kids like that they no longer have to snuggle on the hard wood while they read. Emily sits here and plays her ukulele sometimes while I'm preparing dinner. It's a good place to be. This is not the final accent pillow, incidentally. This is only my placeholder ikat pillow so the kids have something to lean against while I decide on accent fabric for the real pillows. But that's another story! Sometime during the remodeling, we went to Singapore. I hope to share some photos of that at some point, when I feel like I've hit normal again. Here is one measly photo in the meantime: a stack of satin ribbons that the girls bought in Singapore for this year's kids' craft fair. After the success of last year's, they've decided they're going to do ribbon wands again, this time in more rainbow hues. Haberdashery is so much cheaper (and varied) in Singapore so they went shopping and snagged all these colors. I love that they're planning ahead for their summer projects! Congrats on your patience and persistence! Not only on the bench cushion, but through all the house hassles besides! I'm sure you must be delighted with the end results. The cushion looks fabulous! I'm afraid I'd have deemed the first one "good enough", at least for a few years till I couldn't stand it anymore, if it were mine. So you did go to Singapore! I'd wondered but kept forgetting to ask. Looking forward to more of your posts again! Congrats on holding it together during remodeling...I can't imagine the disruptions on the various levels this impacts. Thanks for the insight on cushioning-I would not have known most of that and would have ended up with very sad cushions indeed. And settled because I would not have known how to fix it. Sigh- I deeply appreciate all the insights you offer on so many levels. 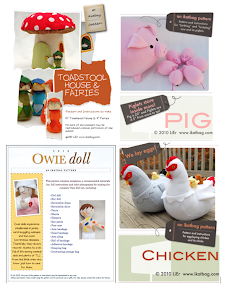 I am really looking forward to this years craft fair. I loved your storytelling of the last one, and the very mature nature your girls demonstrated. Your cushion (particularly version 2) is impressive. I adore window seats. Such a lovely space to sit and read or dream. Someday I will live somewhere with one, I hope. I love all the ribbons your girls found in Singapore. It's great to have you back! I liked the first model, then saw the second and I UNDERSTAND! It is so much better - Well done. Where in Singapore did you go for the haberdashery? Where gong later this year too. Accordian3: There is a building called Textile Centre, along a road called Jalan Sultan. Google it for a map. Take the MRT (train) to Lavender Station and walk through Crawford Centre (another building) toward Jalan Sultan. Enjoy shopping! Textile Centre is my absolute favourite place for haberdashery shopping. Everything is so cheap and great quality. Zips are about 1/10th of the price they are in Spotlight (big retail sewing & fabric shop). And it gets even cheaper when you buy in bulk!! Yay, more shopping! So glad you're a fan! I wish we had a place like Textile Centre here in the US. And I tell everyone I meet who expresses even the vaguest interest in sewing all about it. I even offer to drive them there so I can show them around ... and maybe buy a few more things for me!! ;-) My endless thanks to you for introducing me to the Textile Centre. Wow. That rambled, hmm? Anyway, the farther I got into the blog, the more interested I was in "what's next?" So congrats on the returning home equilibrium, and yay, you're back! Hello, Tiffany! Thank you for leaving this lovely comment. I am so happy for you having a permanent place for your sewing machine and crafting adventures. I hope you reach the end of your home improvement journey soon, too. It will be worth it - tell yourself that, okay? I feel you! We've been remodeling since August, and it doesn't look like I'll get my sewing space back until July. Sewing in the dining room and having to clean everything away all the time just doesn't help creativity. Kara: Hang in there! July is just around the corner! I always have to hold my giggles when someone comments about home dec being easier because "there are no fitting issues". For things that don't move or complain "it itches", home dec items certainly manage to have their own set of fitting issues. You did good on the cushion and I love that stack of ribbons! JustGail: fitting issues are everywhere, aren't they? Even in cardboard projects. But you're right - at least cushions don't complain the foam itches! Congratulations on the end of the remodeling (and the trip to Singapore). 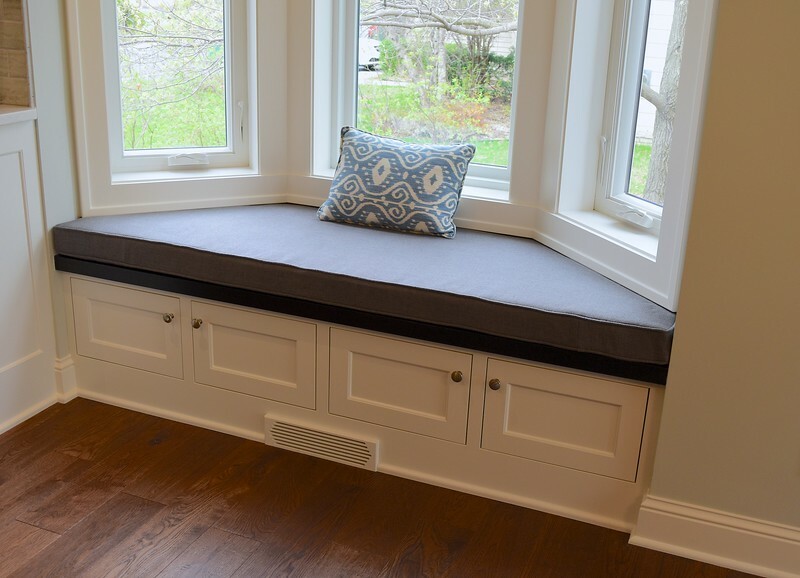 We have a window bench with a similar issue (the cushion announced very loudly that the bench was not level with the windows because old house). I finally retired the cushion, and now it's the backpack/briefcase landing pad. I love my old house, but the kitchen is the room where no one thing quite 'squares' with another. And roller shades and foam are so flat and/or perpendicular! So, we go without! Oh my. I'm about to do this and now I'm nervous I'm going to mess up! I had a random thought at the end with the ribbons: your girls might be inspired by the names of the fairies in Midsummer Night's Dream. Maybe a little naming and branding? I have all boys, and all the boy crafts are ridiculously hard. But if vicarious enjoyment here. Lissa: that is a GREAT idea! 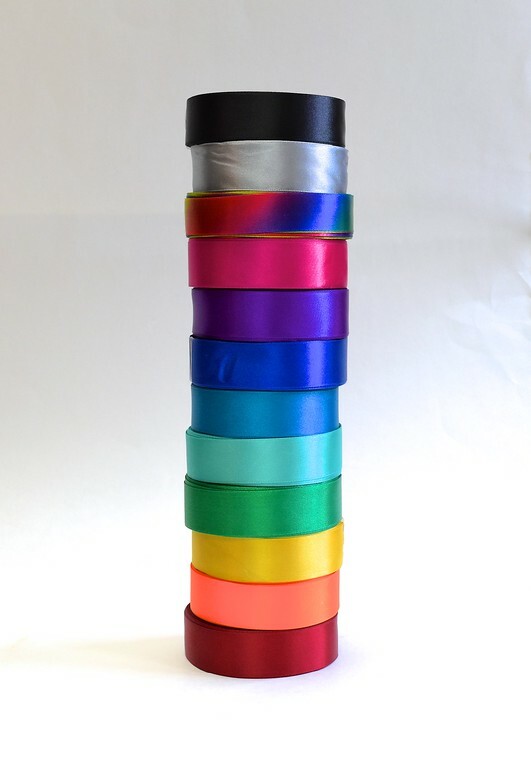 Thank you so much - I'm going to pitch it to the girls to see if they'd like to do that to differentiate between the ribbons of different colors. Yay! Ha! 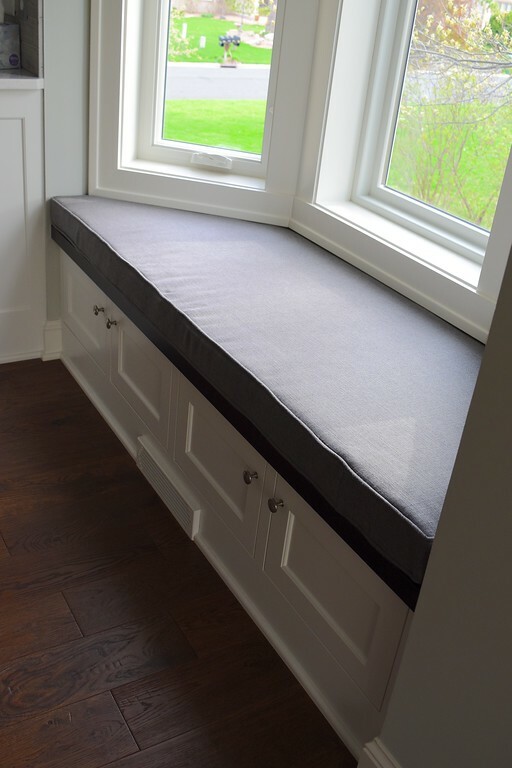 I have a triangular window seat that has gone without a cushion now for 20 years just because my story would have ended with the first trial.